The missus has discovered various new crafts, having plonked herself in the land of the maple leaf, moose and ice hockey….., in no particular order, vine weaving, wine charms and making cards, along with her love of painting. You can find pictures, info and details on all of her creations on her site, Artistikka. Head over there now, click here…. You will be able to buy items from this blog soon. She keeps on at me and I will, honestly get round to it soon. 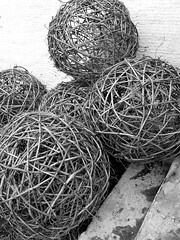 how about some photos of your balls and any other objects you make ? p.s. never been first at anything !! Congratulations on being first then, Violette!